While dining at C Restaurant, Alvin asked me whether I was attending the BC Food Expo. Well, I didn't apply for media accreditation nor was I directly involved in the restaurant industry. Therefore, my answer was no and I didn't even think of reconsidering. Then all of a sudden, my father-in-law (who used to be an Executive Chef) asked if Viv and I wanted to go. Um... I suppose... As much as the Food Expo is a good event for those in the industry, I really was in no hurry to see the latest in wok pit technology (although secretly I want one in my house). After watching the BC Chinese Chef of the Year competition hosted by Stephanie Yuen (where Mijune was a judge), we did a quick round and headed out of the Vancouver Convention Centre for eats. 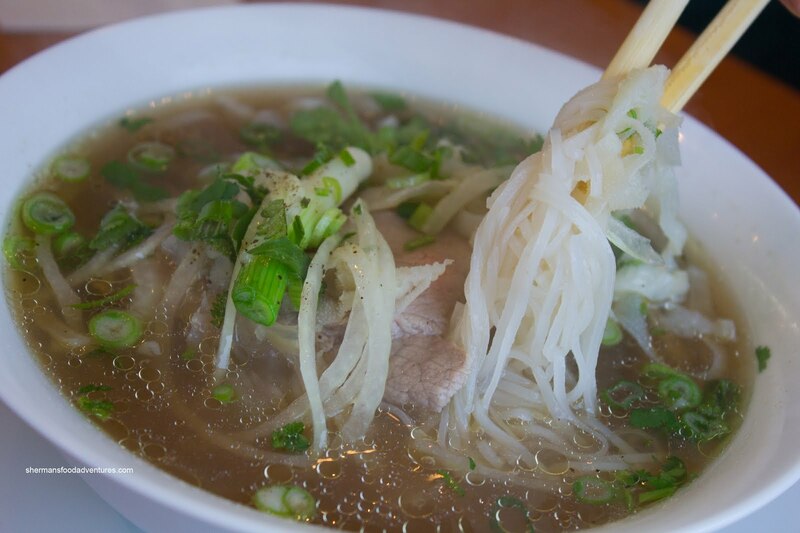 We really had no predetermined destination, so we merely drove up Kingsway in search of Pho. With all the choices available, the world was our oyster. But for me, the one place that caught my eye was Pho Thuan An. The attractive red paint job on the outside along with the modern signage got my attention, unlike some other divy-looking places with an abundance of neon. Saying that this restaurant is small would be an understatement. I think my bedroom is bigger than the entire dining area. We were welcomed by a very friendly and courteous owner who seemed to be the only person on the floor. We wondered how he would handle everything when it got busy since it was already hard to flag him down with only one other table present. So when we did get his attention, Viv ordered the Smoked Salmon Salad Roll to start. We really liked this different approach to a generally standard item. It consisted of smoked salmon, real crab meat, cucumber, romaine lettuce and green onion. There was a good combination of textures and flavours going on in the roll, yet the thing that brought it all together was the dip. 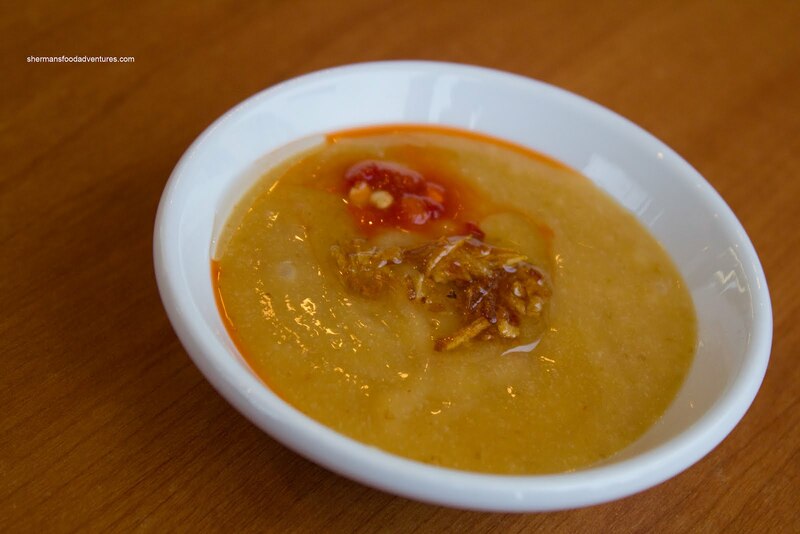 It was a sweet peanut concoction with a small dollop of sriracha, fried garlic and fish sauce. This was some tasty sauce I tell you with a mix of sweet, spicy and aromatics. My father-in-law had the Pho and it arrived steaming hot, as it should be). The broth was light (good balance of sweet and savoury though), yet still had flavour at-the-same-time. There was very little in the way of an MSG hit. The noodles were a touch soft while the meats were tender. For myself, I wanted something different and decided to go for the Cambodian Dry Noodles. Sitting on top of rice noodles, instead of the usual broad egg noodles, there was shrimp, quail egg, sliced pork and liver. This was a pretty large bowl of food with plenty of ingredients and noodles. I thought that there might've been a touch too much sweet soy sauce mixed in with the noodles, but when eaten with the rest of the components, it wasn't as salty. 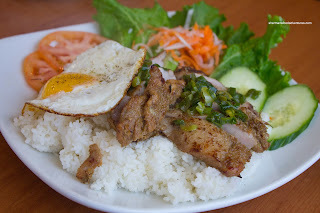 For her main, Viv had the Lemongrass Chicken on Rice. We loved how it was served with a fried sunny side egg (it always makes eating rice a better experience). The broken rice had a chewy texture which was not too dry nor wet. Loved the moist texture of the chicken and the abundance of lemongrass flavour, however, it really need more charring. It almost had a steamed quality to it. Unexpectedly, we were presented with a complimentary order of Che Dau Trang at the end of the meal by the nice owner. 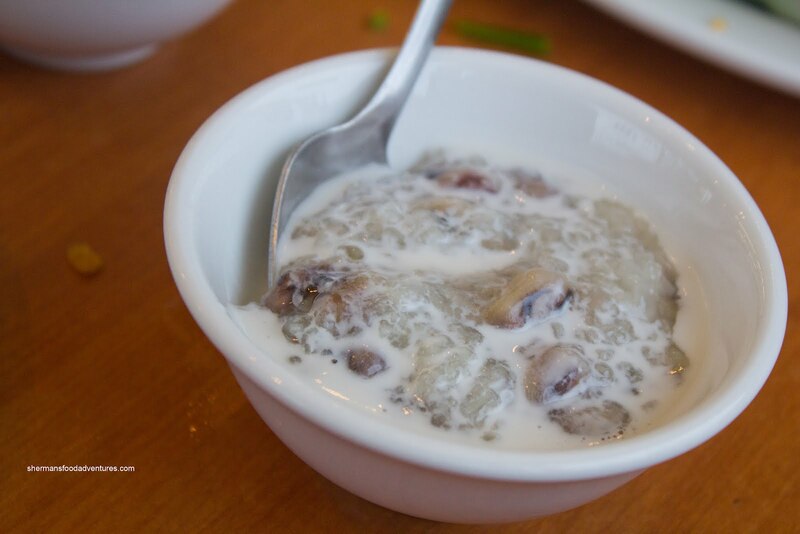 This dessert consisting of sweet sticky rice & bean pudding with coconut milk was only semi-sweet and served warm. This was a nice ending to a surprising meal. 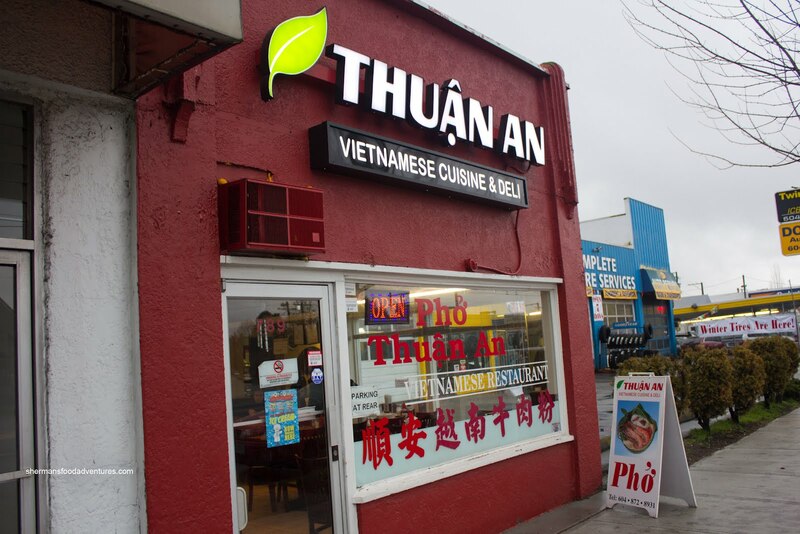 For such a small place, Thuan An serves up solid eats at a reasonable price. Furthermore, the service, as sparse as it is, is warm and honest. 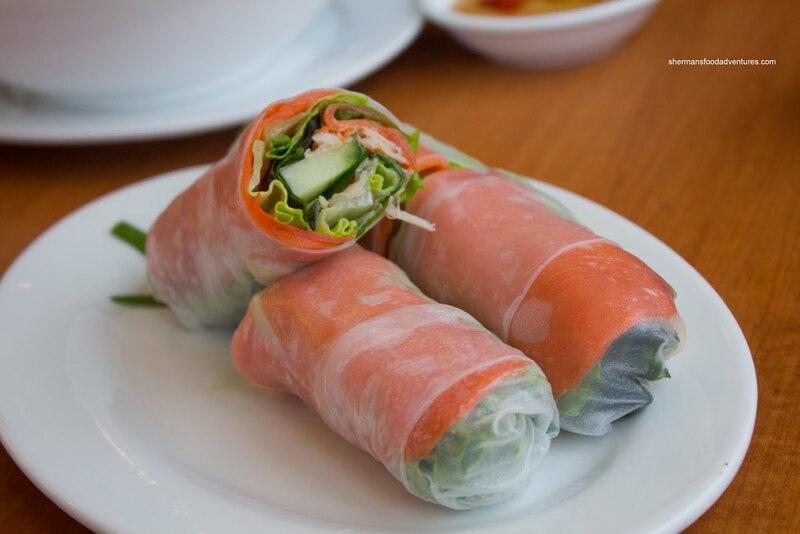 In a sea of Vietnamese restaurants, it is very hard to differentiate the good from the bad. 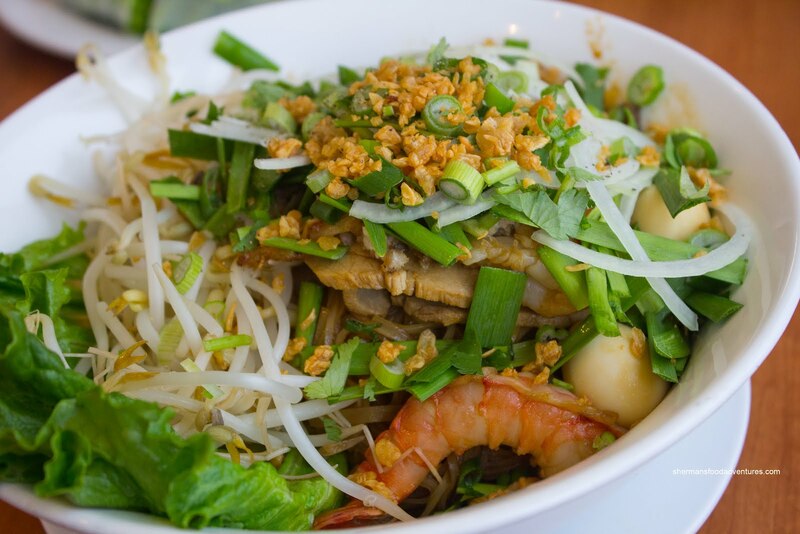 Yet, Pho Thuan An certainly succeeds in separating themselves from the regular. Finally I took the time to have a quickie bowl of noodles at Thuan An. In short ...... GREAT. I was the 2nd customer in there when I arrived around 6:45pm. Scanned the menu, went for the large seafood & liver egg noodles in soup. What a bowl of heaven it was. All the 'fruits de mer" were cooked just right, a couple prawns were delicate and tastily fresh. Oh, what's this ..... quail eggs ? I got 4 of 'em, and the inside was still almost like poached eggs in doneness. Sweet. The pieces of pork and pork liver were sliced thick yet tender. The generous amounts of fried garlic and shallot bits gave the bowl an undeniable fortitude and body I couldn't resist. Deeper down I found quite a bit of chopped Chinese chives. While they're great, I felt there was perhaps too much here. In fact I wondered if this bowl even needed chives, perhaps they threw it in to counter the pork liver ? Wouldn't have mattered to me. The fact I managed to hit dry bowl bottom with my soup spoon said something about the quality of their ingredients. A nice 'lil bonus freebie at the end of the meal ...... they give you a small bowl of corn "pudding" topped with coconut milk. A nice, not-to-sweet way to dress my palate for the road. @LR Yah, it is hard to find Vietnamese restaurants that stand out. This one does.